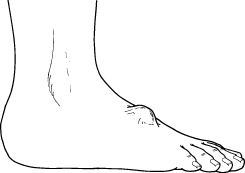 Ganglion cysts are benign (harmless) lumps of lubricating fluid found around joints (think moving parts) like hands, wrists, knees, ankles, and feet. Ganglion cysts are usually harmless but sometimes causing aching or pain when pressuring an underlying nerve or when moving a joint. Oddly it affects women mostly between the ages of 20-40. Unfortunately ganglion cysts can sometimes recur for which we must simply repeat the aforementioned options.